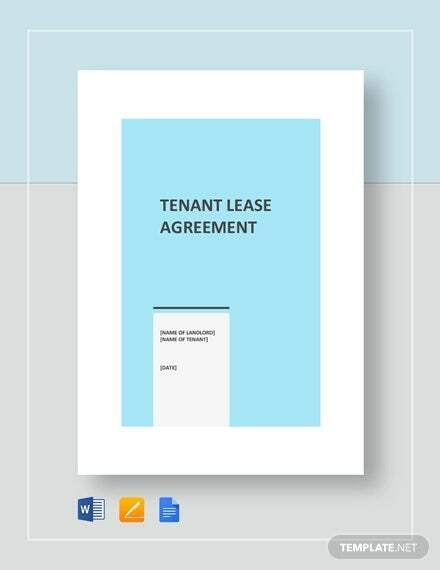 A house Lease Templates is a legally binding document that binds a tenant and a landlord into a rental agreement over the resident’s use of the landlord’s property. In the majority of cases, the landlord will have the tenant fill up an application which the landlord will review, after which the agreement will be drawn up. 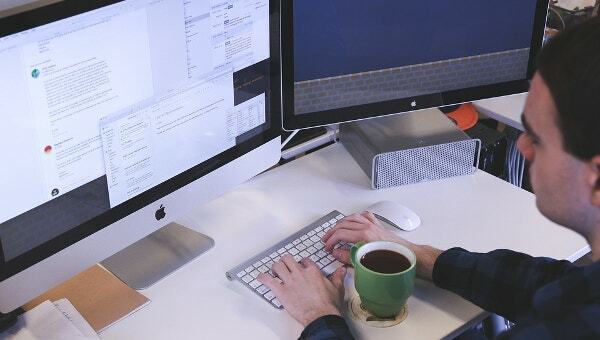 To make sure that the lease agreement samples includes all the necessary terms for the mutual benefit of the landlord and tenant, lease templates can be used to draw up the agreement. 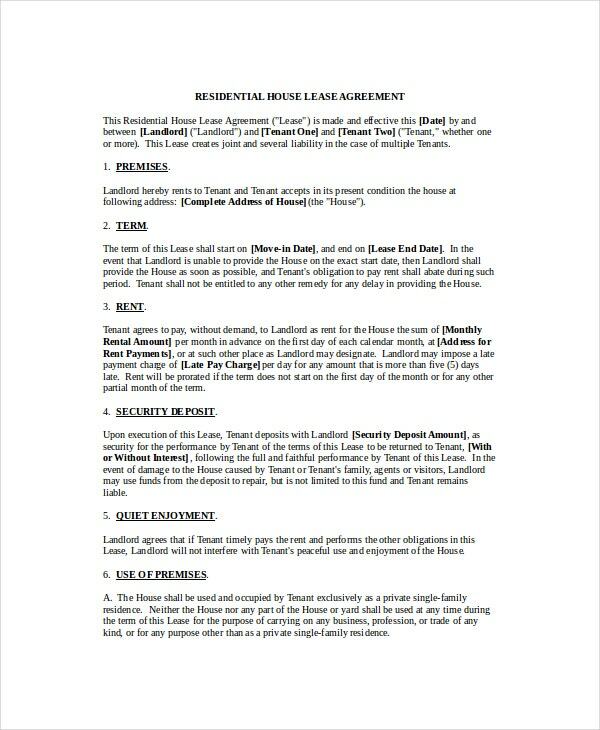 A residential house lease agreement template can be used to define the terms under which your tenant is allowed to lease your property. You can include terms covering the number of occupants, subletting, alterations, damage to property and other such relevant topics. The house rental lease template can be used to draw up an agreement about the terms of rent payment. Rent is paid monthly and this document will state the terms under which the rent is to be paid. You can also see Sublease Agreement Templates. 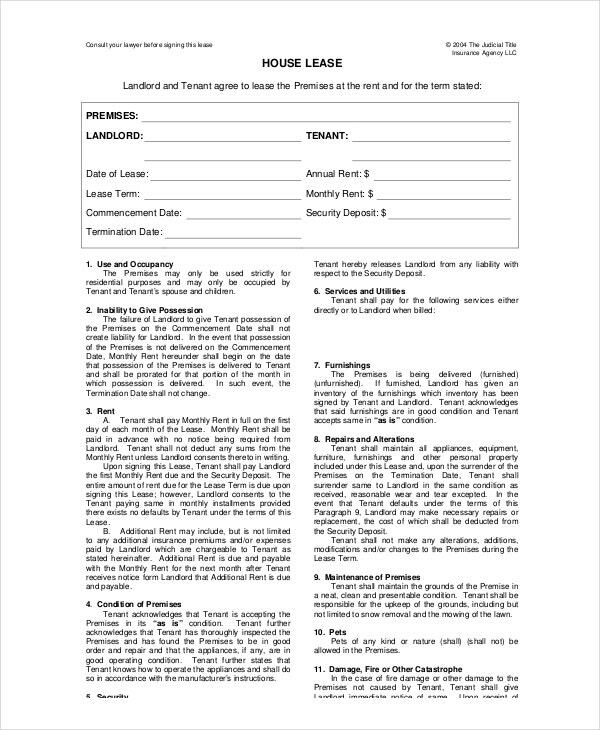 A house lease contract template can be used to create a formal contract between tenant and landlord, covering all the relevant conditions that are placed on the tenant. The language and formatting of the contract are more formal than that of an agreement. 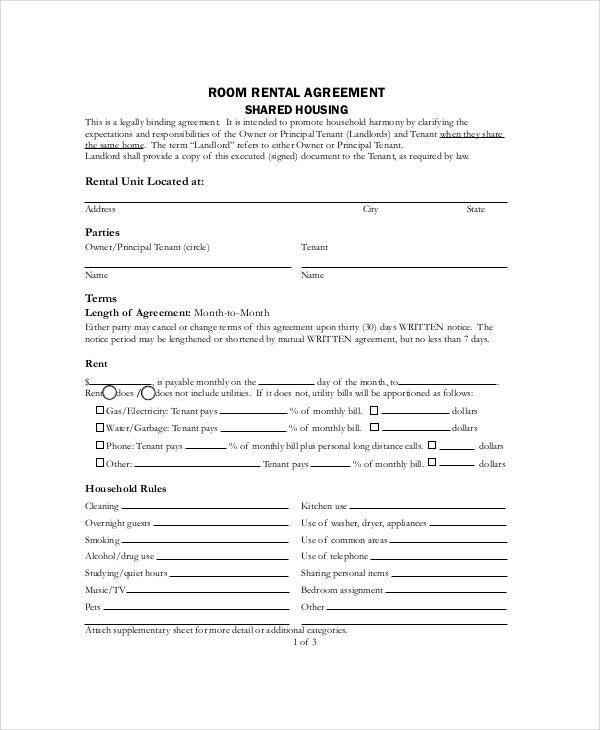 A landlord usually has a potential tenant fill up a form upfront that includes information about the tenant such as present and past addresses, employment history, vehicle and pet information, etc. 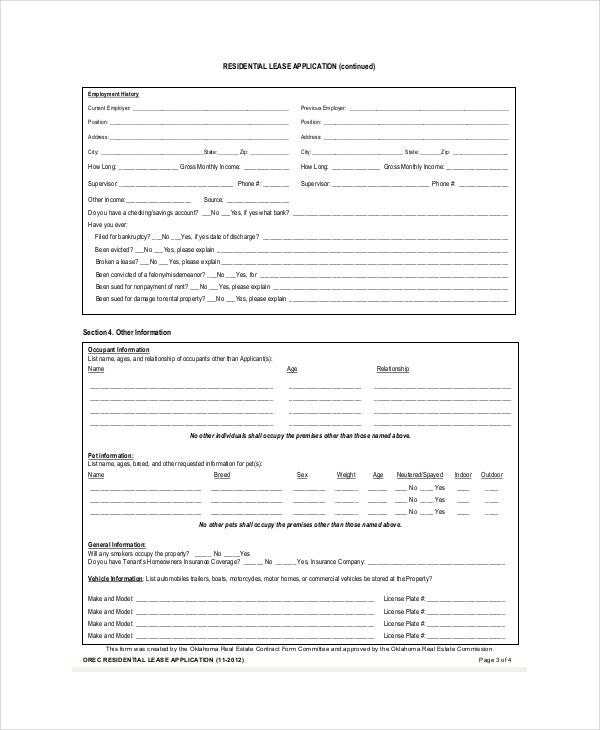 A house lease application template will help you create your own. 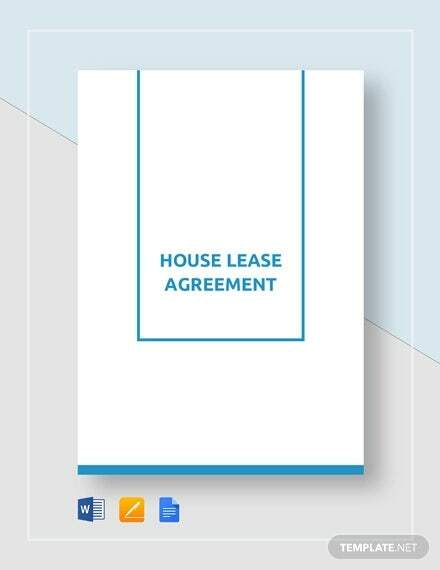 A standard house lease template will help you quickly draw up a lease agreement including all the major points that are to be included in a lease agreement. It includes conditions about bankruptcy, notices, signs non-waiver conditions, etc. What Can Be Included in the House Lease? 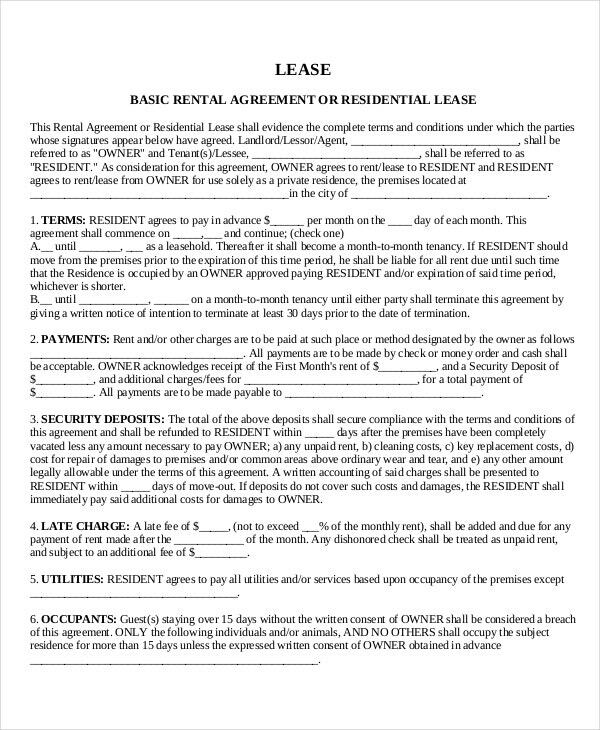 The house lease agreement generally mentions how long the lease is valid for, the names of the lessor or landlord, the rent, the address of the residential or commercial property, etc. It states the terms under which the lessor (or landlord or owner) and the lessee (tenant or resident) enter into the agreement. You can also see Lease Invoice Templates. It will include the payments which are to be made by the lessee and how often. It also includes the terms under which the security deposit will be held and refunded by the landlord. It will also include mention of late charges for failing to pay rent within the due date, terms of payment for utilities, conditions placed on bringing in guests and any other conditions placed on pets, etc. > How Does a House Lease Work? In general, a landlord asks a tenant to fill in a lease application, and then a lease agreement is drawn up based on agreed terms. When the tenant signs, he is bound to the terms of the lease, which may cover the duration of stay, payments, security deposits, utility charges, etc. If you are forced to break a lease agreement for some reason and move away before the term is up, your landlord may make you buy out your lease (by paying the rent for the remaining months on the term). Or he may hold on to your security deposit and let you leave. You can also see Lease Agreement Templates. > Lease vs. Rental. Which to Choose? The words ‘lease’ and ‘rent’ are often used interchangeably. But you should know that there is a little difference between them. Lease agreements are generally of longer duration, generally 6 to 12 months. Within this time, the tenant must keep paying rent and cannot vacate the property. The landlord also cannot force the tenant to move. Rental agreements, on the other hand, are usually made on a month-to-month basis. The terms of the rental agreement can be changed by both the landlord and the tenant. Both types of agreements have their own advantages. Leases offer long-term security for both parties, while rental agreements offer flexibility.